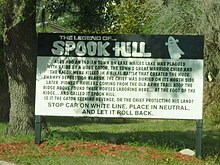 Spook Hill in Lake Wales, Florida. One of central Florida's lesser known and older attractions. Spook Hill is a gravity hill, an optical illusion where cars appear to roll up the spooky hill in Lake Wales, Florida. Spook Hill is located on the Lake Wales Ridge, a geologically significant range of sand and limestone hills, which were islands from two to three million years ago, when sea levels were much higher than at present. The attraction is adjacent to Spook Hill Elementary School, which adopted Casper The Friendly Ghost as their school mascot. The attraction is also in close proximity to Bok Tower. Spook Hill received national media attention when an article about it appeared on the front page of the Wall Street Journal on October 25, 1990, and it was featured in a segment on CBS Morning News with Charles Osgood on November 5, 1990. It was listed on the National Register of Historic Places in 2019. ^ Tampa Bay Skeptics: Do cars really roll up Spook Hill? Tampa Bay Skeptics: Do cars really roll up Spook Hill?